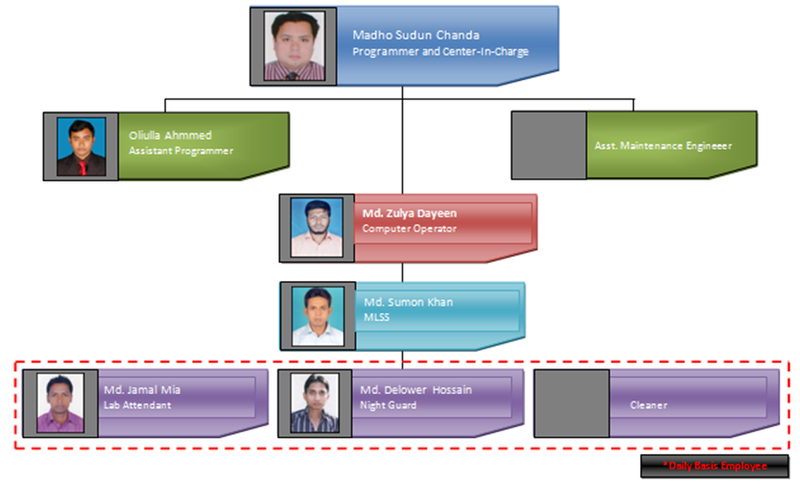 Bangladesh Computer Council (BCC) is a statutory body under the Ministry of Posts, Telecommunications and Information Technology, Government of Bangladesh (GOB). It was established by Act No IX of 1990 passed by the Parliament. The main activities are (not limited to) encouraging and providing support for ICT related activities, formulating national ICT strategy and policy, creating standards and specifications of ICT tools for government organizations according to their necessity, working for human resource development in ICT sector. It has also established National Data Center for hosting all the government websites, e-mail services and web applications. It is the only TIER – 3 certified Government Data Center in Bangladesh. In the near future, it will act as the only Gateway to access internet services for all of the government organizations. BCC is continuing ICT infrastructure development of government through several development projects/programs to facilitate access to government services from root level. In this vision, BCC has organized workshops, seminars, training on subjects related to ICT and has established throughout the country UISC (Union Information and Service Center). Promote the effective application & Expansion of ICT. Develop Human Resource for effective use of ICT. Formulate & Implement National Strategies and Policiesregarding Computer& ICT. Cooperate with the Government and other agencies to implement theObjectives of the National ICT plans. Advise and Encourage the Government and other agencies for the useof Computer & ICT. Determine the Standards and Specification for Computer and ICT at theNational level. To Promote the use of Computer & ICT for the socio-economic development of the country. To Developing Infrastructure Facility for the introduction of ICT in Bangladesh & promote professional efficiency in the field to computer education and training. To Built-up People/nationals to compete in the growing IT industry in the International market. To Developing Human Resource in the field of ICT and Organize manpower export in the International market. To Formulate and Implementation strategies and Policies related to ICT. To Collaborate the Cooperate with the government & other organization and assist them for attaining the national IT Objectives. To advise the encourage the government and other organizations in using computer and IT. To advise organizations concerned regarding Security Measures to be adopted for using IT. To organize, equip and maintain computer institute, library and laboratory for the overall development of IT Industry. To Collect, Analyze and Publicize information related to IT. To Preserve & Publish Report, Periodicals, Paper on IT and related subjects. To Organize Workshops, Seminars, Training on subjects related to computer and IT. To give Grants to Initiate or Conduct research, Study or Training on Subjects related to IT. To Communicate and Cooperate with the Concerned Govt. Organization, Private Sector Organization, Local and Foreign Bodies for attaining the national IT Objectives. To enter, Subject to the approval of the government, into any contract or agreement of any kind with foreign firms for the purposes of the BCC. To discharge any other function assigned to or Delegated to it by the government from time to time. To Develop Specification & Standards for the IT industry at national level. To do such other acts and things as may be necessary to be done in connection with, or conductive to, the performance of the aforesaid function.